The NASA Space Apps Stuttgart 2015 Hackathon winner BigWhoop is a finalist for the NASA Global People's Choice Award! The NASA Space Application Challenge 2015: one hackathon weekend, 133 cities around the world, 949 projects, and our BigWhoop project is among the final 15 for the global People’s Choice Award. Read on to learn what happened during the event at the Stuttgart hackerspace shackspace and then go on and vote for BigWhoop and make it win the award! NASA’s Space Apps Challenge is an international mass collaboration/hackathon organized on a global scale and held in all major cities worldwide, with a focus on finding solutions to challenges faced in space exploration and also to life on Earth. The Winner of the Stuttgart chapter of Global NASA Space Apps Challenge is BigWhoop. BigWhoop addresses the “Open Source Air Traffic Tracking” Challenge. This challenge required the building of a tool that allowed users to select a particular flight and see its out-the-window or other views of the aircraft, and airspace. We decided to extend the scope of the project a bit. Our app was designed as a global sensor grid to measure the whole radio spectrum -thus making air traffic monitoring a subset of the solution. This free and community driven approach based on small and low-cost software defined radio devices earned the local team a global nomination for NASA’s People’s Choice Awards and will be competing to be among the final 15 out of 949 projects for global People’s Choice awards. And now you can vote for the Stuttgart Team as of 27 April. Just visit this page and vote for our #BigWhoop app (once a day). shackspace is proud to support and host AerospaceResearch.net – a student team at the University of Stuttgart – in bringing back the NASA Space Applications Challenge (Space Apps) to Stuttgart. This year the goal is have a bigger, better event as well as a small head-start to give us a better chance at winning one of the awards ;). And we are inviting you to become a part of it! On Saturday the 28th of February at 18:00 o’clock you can join the Kickoff event, start a team early and get your ideas in (the actual Space Apps event will be held in April). Also, if everything works out well, participants can get a paper on their project published at the International Astronautical Congress (IAC) 2015. The AerospaceResearch.net team is working on the Distributed Ground Station Network for tracking small satellites and it’s proof-of-concept project BigWhoop, a global sensor grid for radio spectrum monitoring with software defined radio. You can either join the team or work on any of the other projects. We already hosted Space Apps in Stuttgart in 2012 and it was a great event for working on space projects within an interdisciplinary team as well as for networking. So feel invited to be part of this great space event and the global space community! For more information just visit the kickoff event (there’s a free case of Club Mate Cola!). Es passierten auch Dinge im shackspace, als fast alle auf dem #CCCamp2015 waren. 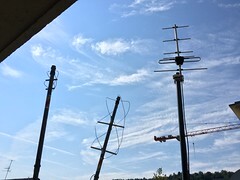 So hat der shackspace nun vier Antennen für den Empfang von diversen Satellitensignalen auf dem Dach. Konkret geht es um Signale von Forschungssatelliten, Cubesats, Wettersatelliten und auch die Internationale Raumstation (ISS). Mit dem nun angepflanzten Antennenwald möchten wir allen Interessierten zeigen, wie man Satellitensignale empfangen kann, was Satelliten senden und wie man seine eigenen Antennen bauen kann. Interesse geweckt? Dann komme im shackspace vorbei! Ein RTL-SDR Empfänger („DVB USB Stick“), den man zum Empfang benötigt, gibt es vor Ort. Wer gar einen rad1o Badge auf dem CCCamp2015 ergattern konnte, der kann diese dort natürlich auch gleich testen. Meldet euch einfach über unsere Constellation-Mailingliste. My TYCHO paper is now published in Acta Astronautica! I did that as my Diploma Thesis at the Institute of Space Systems at the University of Stuttgart and the paper was selected for Acta Astronautica during the International Astronautical Congress 2013 in Beijing.